This weekend we pared down the boxes in our garage. Already lean when it comes to clutter, I still had those can't-bear-to-give-up items which never found a home. 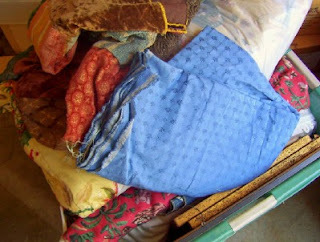 How many more times could I move these fabric remnants, too-short valances, and frames? I toyed with the idea of having all my friends over for a "free yard sale," but my husband had a deadline in mind. We kept telling ourselves, "USE IT OR LOSE IT." With Copper's Wife's inspiration, I reduced the larger fabric remnants into a neat stack of table squares. Some aren't long enough to drape our oval table completely. I still think they look great when placed on the diagonal over our old table's black finish. 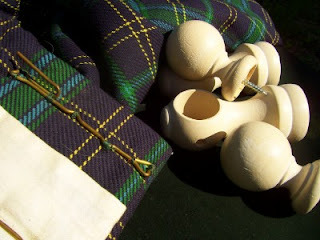 I also made a do-or-die decision about this set of wool tartan draperies. My aunt bought them at a house sale and never used them. They are supposed to have come from the family estate in Scotland. I'm going to hang them in our bedroom, even though the greens are not a perfect match. Maybe they'll go with the fish. I've been decluttering today, too, and trying to be unsentimental with the stuff going in the donation box. Good for you, Meredith!!! I love finding new purposes for stuff I have on hand that is just sitting around! Way to go! I like the tartan curtains but I'm mostly curious about your green velvet headboard. Did you make it? Dh and I are headboardless. It's a king sized bed and it's a bit of money to get one that we like new and it just never has seemed necessary. Although I would like one. Our latest house has wainscoting where the headboard would go and I'd hate to scratch that up... Anyway, here I am rambling about that. I too have piles of old curtains that I had in our old house that I can't make fit in our new one. Meredith, I'd guess the tartan will be wonderfully warm and cozy for winter. I too am on a decluttering kick as our fall weather begins. Jenny's vegcafe: we made a headboard for our king size bed by horizontally mounting two panels from louvered bifold (or trifold?) doors directly to the wall, after painting to coordinate with our other furniture. It is the exact right width. Don't know how frugal it would be if you had to buy; ours came from a closet we deconstructed. Oh, I am glad you are using the tartan curtains. I think they will complement your B&B theme well. PLus green is one of those colors that you can mix a bit with and it still comes out well.